Miele is so confident in the quality of their products, they have designed a new, cost-effective way for you to multiply your warranty. The MieleCare extended service contract delivers four additional years of worry-free operation of your appliances (five years total, Miele standard warranty is 1 year). This contract is not valid for rotary irons being used in a commercial setting. The manufacturers warranty on any residential equipment used for commercial use is 6 months parts & labor from the manufacturer. A staff of technical service representatives is available to effectively manage your questions, and if need be, schedule your service appointment on a day and time most convenient for you. When you call Miele, you get Miele. 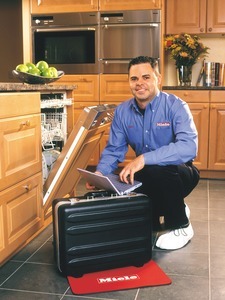 Miele's technicians or Miele's national network of authorized service providers will work with you quickly and efficiently to resolve any technical issues. In fact, Miele employees perform the majority of at-home repairs. Remember, a key benefit of the MieleCare extended service contract is that all services are administered by Miele—courteous, at home service is just a phone call away. If the appliance requires three repairs for the same problem after Miele's warranty expires, Miele will replace it, no questions asked. No fees—just a little paperwork. So you can enjoy your new Miele products from the first day forward, we recommend using the services of an Authorized Miele Installer.